The Scrapple brand of your choice – Habbersett, RAPA, Jones, Arnold’s, Park’s or homemade. Sprinkle both sides of slices with flour. Pre-heat pan with butter or oil until very hot or the scrapple will fall apart in the pan. 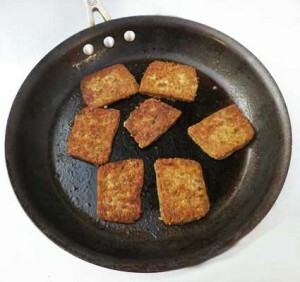 Scrapple is typically cut into thin (quarter-inch-thick) slices, pan-fried in butter or oil until the outsides form a crust, and served at breakfast, as an accompaniment to eggs. It is eaten plain or with ketchup, maple syrup, dark corn syrup, or apple butter. In some regions, however, such as New England, it is prepared by mixing the scrapple with scrambled eggs and served with toast. Scrapple is arguably the first pork food invented in America. The first recipes were created by Dutch colonists who settled near Philadelphia and Chester County, Pennsylvania in the 17th and 18th centuries. Others have posited that scrapple originated in Germany. Scrapple is strongly associated with Philadelphia and neighboring eastern Pennsylvania, New Jersey, Maryland and Delaware. Among the Pennsylvania Dutch and in Appalachia, scrapple is known as pawn haas or pon haus. It can be found in most supermarkets throughout this region in both fresh and frozen refrigerated cases. It can also be ordered online at JerseyPorkRoll.com!